The Bardi Chapel is just one of sixteen family chapels that help compose the Santa Croce Basilica, the largest Franciscan church in the world. 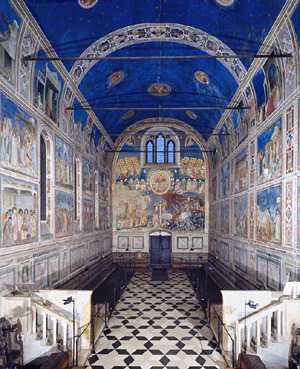 Built and decorated during the fourteenth century, the Bardi Chapel was painted by Giotto di Bondone for the famous, wealthy Bardi family of Florence. Di Bondone received the commission from Ridolfo de Bardi, a banker who, along with his brother, had inherited his father's property and commercial interests. He sought to maintain good relations with the church and other political powers that be (the pope, the ruling house of Anjou, and Guelph political party) with the construction of a chapel. Well-to-do families typically had chapels built and decorated in their honor (and often to appease the church or seek forgiveness for sins they were unwilling to stop committing) and dedicated to a favorite saint. The Bardi family chapel is dedicated to St. Francis, famous for his Christ-like ways during life and his reception of the stigmata, or wounds of Christ. Legend says that St. Francis received the wounds during a vision in which he saw Christ overhead as a six-winged seraphim. The stigmata were said to be granted only to the most pious and devoted servants of God. The Bardi family went bankrupt sometime in the 1340s, taking away their wealth but leaving the chapel untouched. It still stands as part of the Santa Croce Basilica in Florence, the first chapel of the southern transept and located to the right of the choir. Tragically, the beautiful Bardi Chapel frescoes were painted over in the eighteenth century. Although they were rediscovered during the following century and a rework was attempted, permanent damage remains. In the middle of the twentieth century, all the reworked areas were taken away and the areas underneath sealed with plaster. Thus, several of the frescoes are unfortunately marred by empty spaces. 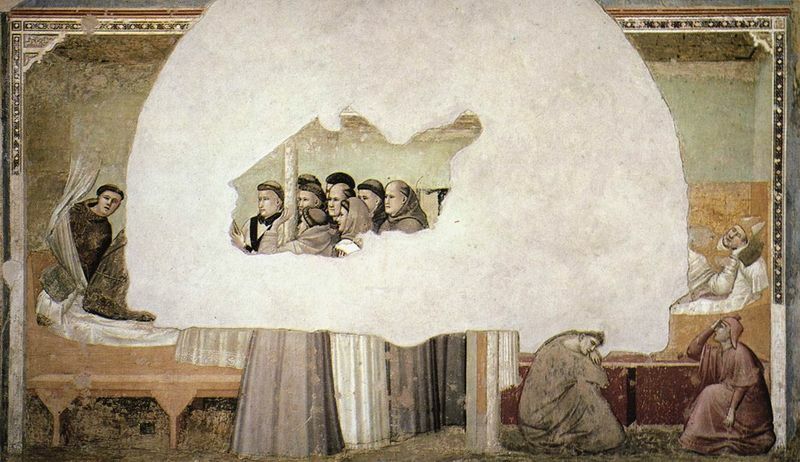 Giotto di Bondone decorated the Bardi Chapel with a beautiful visual narrative of the life of St. Francis. Such a theme was common during the time, and many other chapels and churches from the same period feature scenes from the life of holy figures such as Joachim (father of the Holy Virgin), St. John the Baptist, and the Holy Virgin herself. 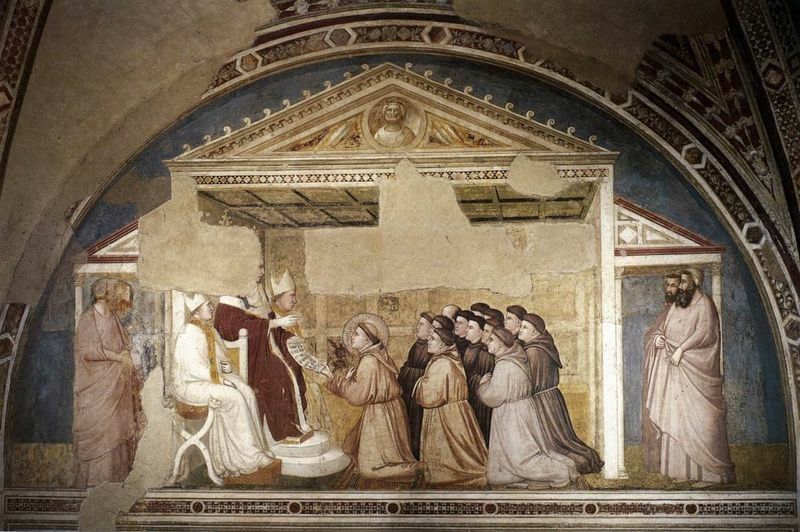 Evidence suggests that di Bondone was a staunch supporter of the Franciscan order, which may be why St. Francis was chosen as the honored saint in the Bardi Chapel. Many scholars believe that, in addition to the overwhelmingly emotional quality of di Bondone's work, the figures therein are imbued with a compassion for their fellows that had never before been seen in religious art. Because the Bardi Chapel frescoes were whitewashed in the eighteenth century and an awkward, ineffective rework took place in the nineteenth century, some of di Bondone's original work is missing or badly damaged. However, plenty still exists for visitors to see today. 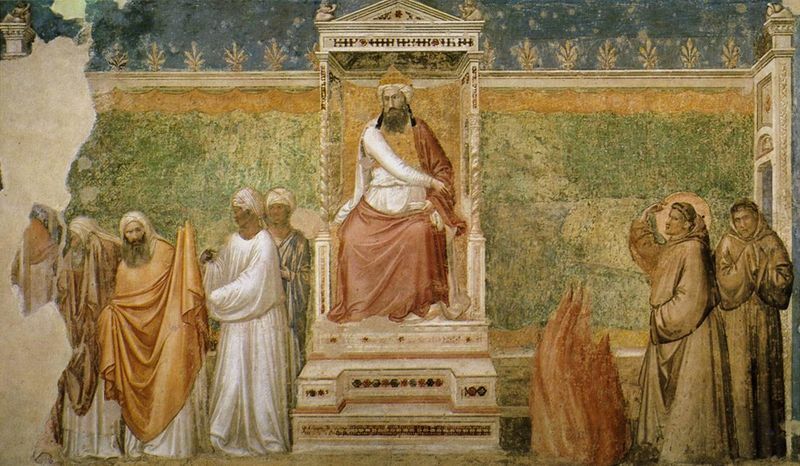 In the Bardi Chapel frescoes, di Bondone takes one of his most decisive steps away from Byzantine artistic method with regard to composition. In Vision of the Ascension of St. Francis, for example, rather than stack his figures on top of one another, or paint all action proceeding toward the viewer, di Bondone paints the dead saint and his mourners as though he were watching the scene from a distance. The mourners come toward the corpse from both left and right, some facing toward and some away from the viewer, as would they would in a real setting. Because of the damage the frescoes have sustained over the centuries, it is impossible to tell the extent to which di Bondone relied on color to tell his story. The colors are rather muted today. However, like his other well-known works, the figures are all clad in colorful robes of blue, green, yellow, and red, emphasizing their lifelike quality. 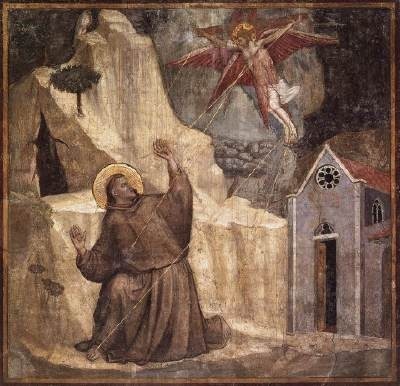 A black sky in Renunciation of Worldly Goods helps to communicate the fury and confusion felt by St. Francis' followers and even his father as he announces his decision. Each of the frescoes in the Bardi Chapel communicates a different tone and feeling: grief and undertones of hope in Death and Ascension, suspense in St. Francis Before the Sultan, and surprise and awe in Stigmatization. Di Bondone uses a combination of facial expressions, gestures, and posture to communicate the mood of his subjects and the feelings that most would associate with the situations he depicts in these frescoes. It is believed, though no evidence exists to support this, that the Bardi Chapel frescoes were well-received and approved of by the Bardi family and all of Italy. Di Bondone's work was highly prized during his life for his startlingly unique and naturalist approach to painting. Throughout his career, he stayed busy with commissions from kings, the Pope, various clergy members, and wealthy patrons (like the Bardi family). Several similar works have been attributed to Giotto di Bondone, but their authorship is somewhat disputed. 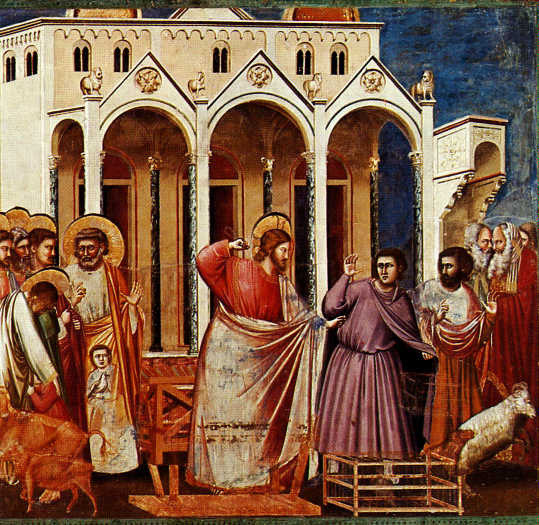 However, the Scrovegni Chapel, located in Padua, Italy, is universally accepted as di Bondone's and bears a general thematic and strong compositional resemblance to the Bardi Chapel. 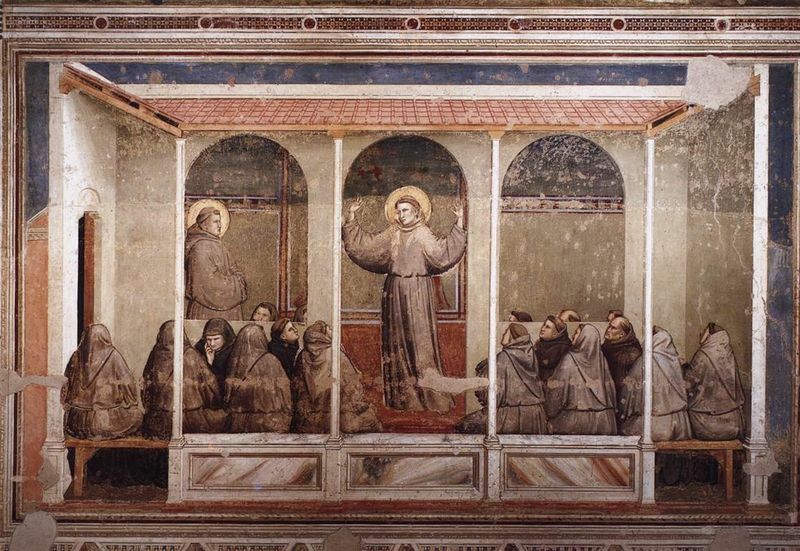 While the Bardi Chapel focuses on the life of St. Francis, the lives of Jesus, the Holy Virgin, and Joachim are featured in the Scrovegni Chapel. In both, di Bondone masterfully uses the available space to create an emotional, riveting visual narrative of the lives of inspiring religious figures. 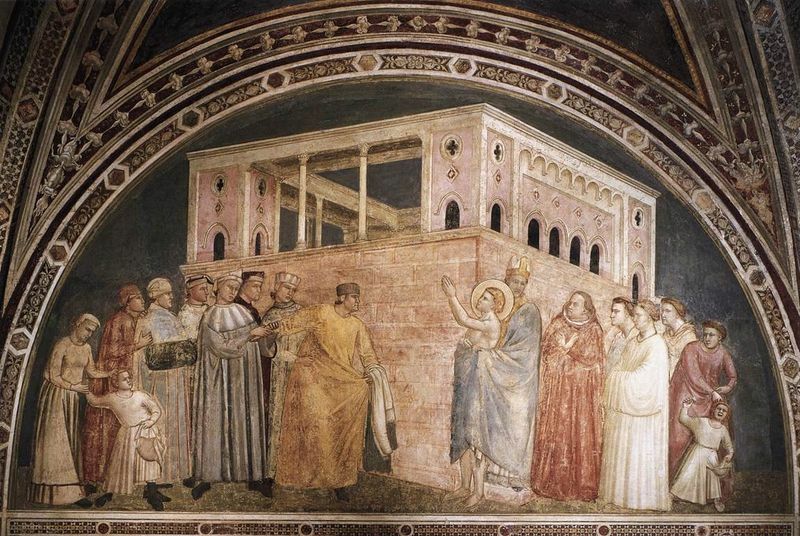 Giotto di Bondone was born into the Florentine peasantry but rose quickly to fame and fortune after a brief apprenticeship under the Medieval Italian master Cimabue. Known for his revolutionary painting style in which human figures appear strikingly real and emotional, di Bondone spent his career painting for the likes of King Robert of Anjou, the Pope and various other wealthy arts patrons. His most famous work is the Scrovegni Chapel in Padua, Italy, though many of his works have likely been lost over the centuries. Di Bondone is credited with kick-starting the Italian Renaissance with his bold and decisive move away from stylized Byzantine painting techniques and toward a natural, humanist approach. His paintings are based heavily, if not exclusively, on reality, eschewing the flowing and surreal brush strokes of his predecessors. Di Bondone believed that representational painting was key in evoking an emotional response, so he focused on painting scenes with high emotional content. His figures wear fully believable expressions of joy, sorrow, grief, anger, horror, and confusion as fitting. They gesture, in anguish or delight, against a backdrop of blue skies and lush green grass or ominous-looking darkness. Giotto di Bondone has been dubbed the father of the Renaissance for, among other things, his technical steps out of the Middle Ages and toward an enlightened and modern art world. 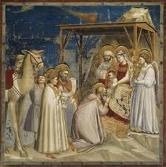 Giotto di Bondone was born in the heyday of many of the Medieval greats, such as architect Arnolfo di Cambio, painter Duccio, and of course his own master, Cimabue. As his career flourished and he rose to fame, many other budding artists began to copy his innovative techniques that largely abandoned the Medieval and Gothic traditions in favor of something more real and natural. It could be said that di Bondone in effect gave rise to naturalism, the strict adherence to reality that is seen in all of his work. In place of the traditional celestial golds and drab, colorless robes of the figures, di Bondone installs vibrantly real colors in a seemingly three-dimensional setting. Gone, too, were the vacant expressions and non-existent emotion in the faces of the human figures: di Bondone replaced them with overt and unmistakable displays of everything from rage to joy. Because of his lack of adherence to any established artistic movement of the time, his work is usually categorized Late Medieval or Early Renaissance. The next recognized movement, International Gothicism, didn't begin until after di Bondone's death in 1337.